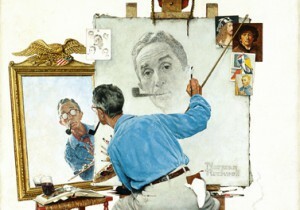 Norman Rockwell (1894-1978), “Triple Self-Portrait” (detail), 1959. Oil on canvas, 44 1/2″ x 34 1/3″. Cover illustration for “The Saturday Evening Post,” February 13, 1960. The four self-portraits pictured on Norman Rockwell’s canvas in Triple Self-Portrait (1959) – Albrecht Dürer, Rembrandt van Rijn, Pablo Picasso, and Vincent Van Gogh – are his references. They invite us to compare (as he did) how other artists tackled the problem of a self-portrait. Triple Self-Portrait is part of the permanent collection of Norman Rockwell Museum. Learn about Norman Rockwell’s artistic influences during our online Google Art Talk to be held on Thursday, September 12, 2013, 11 a.m. ET. Click here for more details.